Local Optometrist Dr Ali Khalife warns about Macular Degeneration and its effect on your vision. One in seven people over the age of 50 are affected by Macular Degeneration (MD), and the incidence increases with age. One in three people over the age of 80 are afflicted by the disease. 35,000 Australians aged over 50 fit into the legal definition of blindness, and in over 80% of cases Macular Degeneration is to blame. What is the macula? Why is it so important to look after it? The innermost layer of the eye is called the retina, and the macula is the central part of the retina that is responsible for detailed central vision such as for reading and driving, and most colour vision. The rest of the retina, or peripheral retina, detects movement and is used to help one get around. That’s why many people with macular degeneration can still get around but not read or recognise faces in the later stages. It is a painless degenerative disease of the central retina that cause progressive loss of central vision. Progressive means there is a “beginning” and “worsening”. Consequently, an eye examination by an optometrist is needed at least once every two years to monitor early signs of macular degeneration, monitor for progress and initiate appropriate management when indicated. Although it is more frequent in people above the age of 50, certain forms of the disease an also affect younger people. A person who has seen 20/20 all their life should not be seeing worse unless there is something obstructing their sight. In most cases, reduced vision is due to cataract, which can easily be removed by surgery. However, if cataract has been ruled out, another reason for the reduced vision should always be investigated by your optometrist. Are you experiencing reduced vision? See us now. 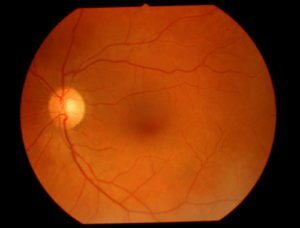 In other words, a person with early to moderate macular degeneration may still be able to get out and about and see but just not the small details. To put this down to age can delay optometric assessment and diagnosis of the disease. This is a common line that our optometrists hear. Although anyone can get macular degeneration, those who smoke are three to four times more likely to develop it, and smokers may develop the disease five to ten years earlier than non-smokers. Yes, family is also an important risk factor. If someone in your direct family have macular degeneration, then you have 50% chance of developing it. If you know someone in your family with macular degeneration, please do yourself a massive favour by checking your eyes with an optometrist. If you have signs of macular degeneration, advise your children, siblings and their children to have their eyes and macula checked. To find out more, please visit the macular degeneration foundation page. Macular degeneration is a painless, progressive disease that could lead to blindness. Are you age 50 and up? Come see us. Optometrists are experts in vision care who diagnose, manage and treat a wide range of vision problems, eye diseases and ocular conditions. By prescribing spectacles, contact lenses, vision aides and other treatments, optometrists help their patients maximise and retain good vision for life. Eyecare Plus Broadway Awarded Finalist for Best in Practice Growth!